I am right now taking an English Composition II class in college and one of the assignments we have is to pick a topic and do research on this topic. 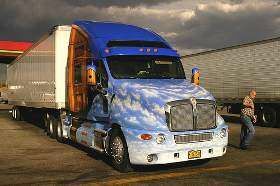 My husband is actually a truck driver for the company swift, so the topic I ended up picking deals with what I believe is a big problem in the trucking industry today, the fact that drivers are paid by the mile rather than by the hour. Truckers have been getting paid by the mile since the rise of the trucking industry, and even voted to be exempt from the Fair Labor Act that would have made them a by the hour pay job just like everyone else in the United States. I feel this is not fair to truckers in this day and age. This is especially true when you take into consideration the time truckers spend stuck in bumper to bumper traffic, not moving an inch, and all the time spent at loaders waiting for live unloads and live loads to finish. All of this time pretty much wasted, because you are still technically on the clock but since the truck isn’t driving down the highway, truckers are not getting paid a dime for that time. Also, the time you spend with the truck whenever you aren’t driving at all. When you are a company driver it is your responsibility to take care of that truck, yet the company expects you to do that completely for free. I know there are some companies that are exceptions to the rule, but overall this is the practice of most trucking companies in this day and age. I believe that this needs to stop and that companies need to consider becoming included on the Fair Labor Act and paying drivers by the hour rather than by the mile. Thank you for taking time out of your day to read this, as this is a subject I feel passionately about and I hope that the industry will soon fix.